Going through the images, I found a lot more good images than I remembered. Good to have something to look forward to: sorting them out, bringing them out into the world. Usually an image that makes it onto the site, into print, goes through a rather long process. I have ways to bounce even moderately good images back into my memory over and over, and I cull out the ones I don’t want to see again. Usually an image needs to haunt me for a while, sometimes to literally enter my dreams. For example one of this summer’s images was in my dreams last night, and so I might work on presenting that one next. Or something might bump into the line ahead of it. This one though, pop! I saw it, saw it’s potential. (asked my wife, my second eyes, who agreed). It needed a crop to a 4×5 aspect ratio to really work. Tonally, it needed just enough contrast to pop and have the tones and forms create their pattern in a distinctive way, without losing the subtlety of tone. A little tricky, that. This was exposed through a somewhat legendary vintage manual lens, Olympus OM 50/2, which is not one I would have picked for this exposure. It’s a lens with only a six bladed aperture, which produces some of the most beautiful of lens renderings when it works out, and some of the worst when it doesn’t. Usually it can be very nice wide open but not so nice stopped down past f4. This was stopped down. I was walking around with just the one prime lens on the camera and not a full bag or two. That I didn’t go get another lens shows I didn’t really see the potential of this exposure. But that’s OK.
And so it is with life: we have our lenses with which we view the world, our colors, our karma, and it’s not always what we would prefer. To some extent we can change the lenses, change what we are working with, but we have to keep working within limitations of our own tendencies, limitations, resources — and the vagaries of the world. The world does what it pleases, and we work with it as best we can. We don’t always like that, but it’s what we’ve got to work with. Photography is interesting right now, on the day it is clear that a misogynist, drunk, liar, and probable sexual assaulter will be confirmed to the supreme court. Today when the weight of one attack after another on decency, honesty, values, hope for the American system, fairness for women, kindness for all — a day when that hope seems rather dim. Photography keeps me going on days like these, even when its importance seems diminished by the significance of global and national political disasters — things which will increase the amount of suffering in the world, for sure. After I heard that Susan Collins would vote to confirm the scumbag Kavanaugh, I went out with my cameras for a bit. How to respond to this crisis of our time? I think there are a lot of reasonable responses, including political activism. Sorry if I lose the few Republicans that are reading right now as fans, but: everyone vote. If you care about decency and you are in the US, vote for Democrats; vote in the midterm elections. Besides voting, and even if you aren’t going to vote for a Democrat, the best thing you can do is to cultivate your own intelligence, compassion, openness, clarity of mind, kindness. Feel the anger that is natural when things we hold dear are falling apart, but don’t let that anger control your behavior. Sure, we feel anger, but let it pass through like a wave. Work with the world we are given as best you can. Walk the path of confusion in such a way that it manifests as wisdom and clarity. I do that with meditation, and my practice of photography is not by any means a substitute for meditation, but it helps. So I keep on. You, a fan of photography, or if you found this by being a fan of waterlilies — look! Open! Appreciate this beautiful world, and see the light inside the dark. 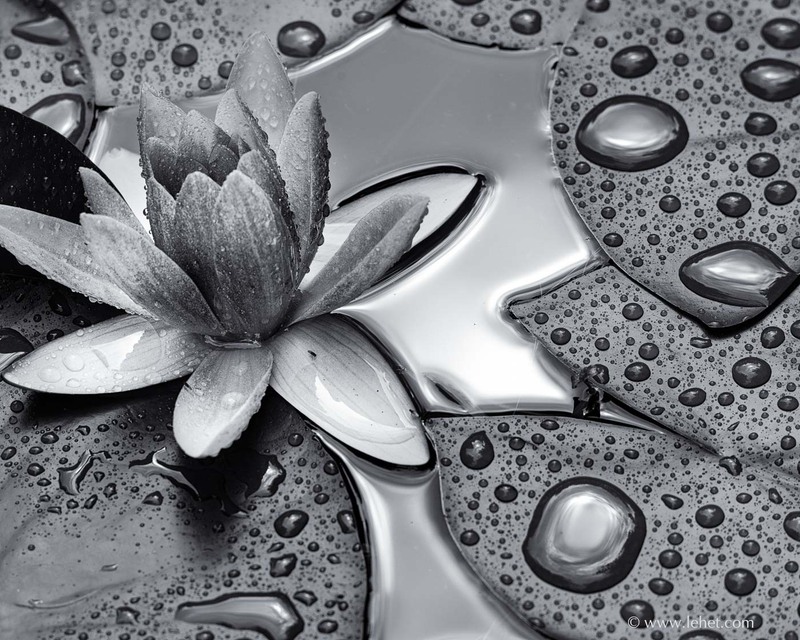 This entry was posted in black and white, Flowers, Musings, New England, Rain, Vermont, Water on October 5, 2018 by john lehet.